1. Crisp phyllo cups as directed on package. 2. In 10-inch skillet, cook pancetta over medium heat 4 to 5 minutes or until crisp. Remove with slotted spoon; drain on paper towel-lined plate. Add mushrooms to drippings in skillet; cook 5 to 6 minutes or until mushrooms are soft and pan is nearly dry. Add garlic; cook about 1 minute or until garlic is fragrant. Add 1 teaspoon of the sage, the thyme and broth. Cook 3 to 4 minutes or until most of liquid is absorbed. Add whipping cream; simmer 1 to 2 minutes or until slightly thickened. Stir pancetta and Parmesan cheese into mixture; remove from heat. 3. In small bowl, mix remaining 2 teaspoons sage and the sour cream. 4. 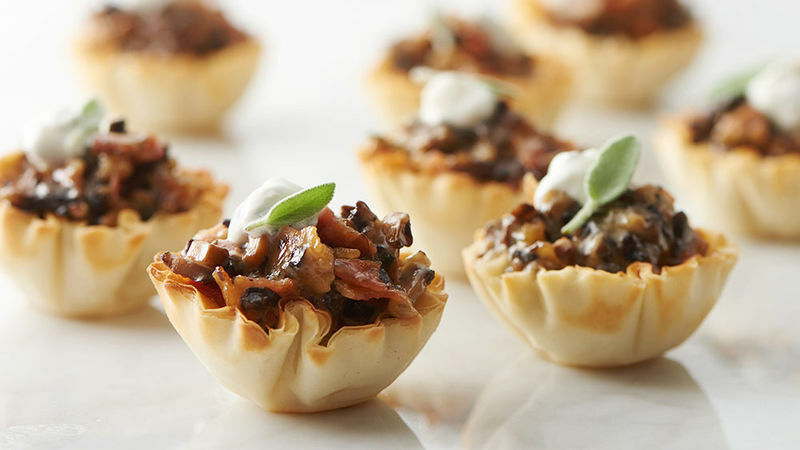 Scoop rounded teaspoons mushroom filling into phyllo cups; top with sage cream. Dried sage and thyme can be used in this recipe. Reduce sage to 1 teaspoon and thyme to 1/4 teaspoon.